The EIPM Certification Programmes enable purchasing professionals to keep their knowledge and skills relevant, applicable and competitive, whilst being an industry standard that is recognised worldwide. The courses are flexible and structured around 2 or 3 weeks of face-to-face sessions combined with up-front preparation and project implementation. The Certification Programme for Buyers prepares participants to take charge of a purchasing portfolio. The training covers the fundamentals of the purchasing function, such as understanding the purchasing process, analysis of a portfolio, segmentation, understanding how to apply the best practices and building a purchasing strategy. The Certification Programme for Buyers is targeted to provide the fundamental purchasing process and tools to buyers with less than two years experience and mostly local purchasing responsibilities. DISCLAIMER: the fees and conditions below apply for individual registrations to the Archamps Campus. For other locations, in-house courses and/or group registrations, please contact us. Segment his Portfolio and define his priorities. Structure his communication with his stakeholders and translate needs into quantifiable, measurable objectives. Implement an objective, transparent supplier selection process. Integrate cost drivers into his roadmap through the use of Functional Definition, TCO and Cost Breakdown tools. Buyers looking to acquire a broader perspective on Purchasing. Employees moving from other functions into purchasing. Employees in regular contact with suppliers. The course can also provide a purchasing culture to Purchasing Assistants as well as to “Internal customers”. Numerous case studies, workshops and discussions are organised in order to facilitate exchange between participants and the EIPM experts. The workshops are a key approach to practice the tools presented, using participants’ own environments. Diagnosis of Purchasing Portfolio: Identify the main segments on which we will prioritise. Buying Centre: how to identify the key stakeholders in the company and their needs in order to satisfy them and influence their future decisions to the common interest of the company and the individual stakeholder. Functional definition of requirements: how to challenge internal customer needs using a structured approach to identify the “right need” in terms of functions desired and not solutions. Consolidation of needs and suppliers (supplier base optimisation) and standardisation as common best practices to obtain cost reduction. Define selection criteria for potential suppliers. Pre-qualify potential suppliers using a specific request for information – Participants will learn how to create one for their purchasing families. Visit suppliers – Participants will learn how to prepare, to carry out and report on a supplier visit. Prepare a Request for Quotation – Participants will learn what the main contents of a RFQ are and how to develop one for their business. Implement a supplier selection process – Participants will learn how to formalise a selection grid and how to implement it through active involvement of the buying centre. Cost breakdown analysis: use price breakdown analysis to prepare negotiation with suppliers and discuss improvement actions. Participants will learn how to build a cost breakdown structure adapted to their own purchasing needs, how to obtain detailed information from suppliers and analyse it for future negotiations. Total cost of ownership: Participants will learn how to build a TCO model adapted to their specific needs in order to select suppliers or to identify cost improvement opportunities. Recognize the different types of inventories. Understand the basics of inventory management, when and how much to order, the safety stock, and the various operations related with inventory set-up, handling, maintenance. Discover the key players and their roles & responsibilities. 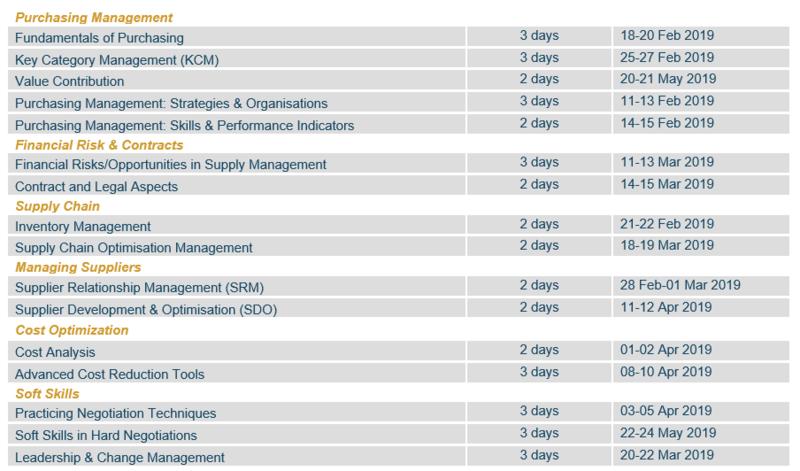 Understand the flows related to inventory management, the demand types and the planning systems. Know the main methods of stock valuation. Select the appropriate options to optimize inventories. Develop an inventory strategy for their supply chain. This course is suitable for buyers and sourcing personnel at all levels. Particularly useful for purchasing professionals, supply chain managers, procurement managers, warehouse managers, and inventory managers who want to optimize the benefits of maintaining inventories along the supply chain, while reducing their costs. A two-day programme using lectures, visual aids and case studies to give participants a substantial set of information and the opportunity to discuss matters with which they are particularly concerned. The seminar explores the numerous practices and conceptual developments in the field of Inventory Management. Know the objective, content and presentation of the 3 main statements included in the financial reporting. Calculate ratios and ask questions to obtain a picture of the financial health of a supplier. Understand the impact of the cost structure on inventory valuation. Assess the consequences of some procurement decisions on the financial statements presentation. People who need to evaluate the financial health of their suppliers or develop strategies to improve the financial performance of their own companies. Presentation of the main financial statements. Description of financial ratios and cost management principles. Definition and use of net present value and internal rate of return. Presentation of methodologies to manage risks and to profile suppliers. Financial analysis of 3 financial statements: balance sheet, income statement, cash flow statement. Formation of groups to team up and play out “Bee Finance”, a board-based simulation game and roll-out quarter 1 under the control of the instructor. Groups take charge of their own company and make decisions regarding strategic spendings, which will determine sales order, production and purchases. Presentation and description of the most common financial ratios. Groups produce their Q1 financial statements and ratios, and compare these to the objectives given by the instructor. Review of points covered and those which need further clarification. Roll-out Quarter 2, make decision from news given by the instructor. Groups produce their Q2 financial statements and ratios, and compare them to the objectives given by the instructor. Presentation of the impact of Costing on Inventory Valuation, of Procurement Finance drivers, of Net Present Value and Internal Rate of Return. Roll-out Quarter 3, make decision from news given by the instructor, negotiate with instructor when needed. Groups produce their Q3 financial statements and ratios, and compare them to the objectives given by the instructor. Roll-out Quarter 4, make decision from news given by the instructor, negotiate with instructor when needed. Groups produce their Q4 financial statements and ratios, and compare them to the objectives given by the instructor. Instructor presents various documents to allow participants to use these in their daily operations. Exercise to assess knowledge acquisition. Understand the international legal framework. Identify the risk linked to an “informal” interaction with suppliers. List the necessary conditions to have a valid commercial contract. Recognise and use some “standard” clauses in contracts. Translate commercial needs into legal terms. Engage better relation with legal teams. Diagnose when and what to report to legal teams to avoid major risks to their company. This course is suitable for buyers and sourcing staff at all levels. A two-day programme using lectures, visual aids and case studies to give participants a substantial body of information and the opportunity to discuss matters with which they are particularly concerned. The seminar explores the numerous practices and conceptual developments in international operations, as well as risk allocation, constraints and opportunities in the contractual and legal areas. Fundamental elements and formation of contracts. Legal wording and contract terms. Applicable law and concept of precedence. Legal families, choice of governing law, ruling language. What is a contract and what are contract stages? Some contracts: Confidentiality agreement or nondisclosure agreement. Licenses agreement, letter of intent or memorandum of understanding (M.O.U. ), master agreement/application agreement. Could other documents carry legal obligation? General terms of sales/ General terms of purchase. Conflicting clauses/the battle of forms (general conditions of sale vs. general conditions of purchase). Duties of the seller and the buyer. Transfer in ownership, passing of risks. Rescission of the contract/anticipated termination. Specificities and points of attention. The objective of this module is to provide participants with the basic knowledge to understand how suppliers calculate their costs and their selling price. Fundamentals of product cost structure. Should cost & cost breakdown analysis. Buyers at any level who wish to learn how to use cost breakdown and TCO decision-making tool to better negotiate price reductions with suppliers. A business case study is used. Enables participants to analyse each major category of cost. Participants constantly challenge the current paradigms and take innovative decisions. The participants work in small teams of three. They learn by making smart decisions and some errors. The first part of the two-day session will be based on a series of exercises to understand how suppliers build up their cost to generate their price to customers. This fundamental knowledge will provide buyers with the background to build-up the cost structure of a supplier. Secondly, a TCO model will be presented - which is a decision-making tool to help buyers to identify cost improvement opportunities that go beyond supplier price. Conduct simple product functional analysis. Develop should cost & negotiation strategy. Create a TCO for a given product or service. Introduction to VA / VE. Fundamentals of cost and financial approach. Product and services cost drivers. What should be the true cost and comparison. Define negotiation objectives, including different options. Built alternative solutions (BATNA) to avoid deadlock situations. Organise their negotiation plan, taking into account their company constraints, the supplier’s expectations and the market situation. Deliver the highest results possible, while maintaining long term relationship with suppliers. Buyers and internal customers who need to conduct or assist in commercial negotiations. Pedagogical approach : Workshops, Case studies, Video training. Tools : Behavioural Pattern, Negotiation Planner, Concessions / Counterparts Matrix. Laying out my control panel. Presentation of the negotiation stages. Workshops: each buyer gives a briefing about a real contemporary or future negotiation situation, and the problems it raises. The other participants and the trainer then help preparing the negotiation by applying the method. The most sensitive cases will then be acted out, using the behavioural pattern, the steps of a buying negotiation, and the best practices for each step. The trainer will focus on the behavioural aspects. The Certification Programme for Expert Buyers prepares participants to have an active role in the definition and implementation of the company’s business and purchasing strategy. The programme also focuses on cross-functional and cross-cultural environments which require specific interpersonal skills. The Certification Programme for Expert Buyers is targeted for Lead buyers, Category buyers, Project buyers, Business Unit buyers with large portfolio responsibilities. Understand the role of upstream and downstream purchasing. Define a purchasing strategy based on in-depth knowledge of their company needs and market trends. Maximize the value delivered to the company. Understand the fundamental steps of strategic purchasing portfolio management. Adapt this process according to the type of global/local organisation (for example within a Lead buyer or Key Commodity Management type organisations). Define a plan to execute the strategy. Measure the outcome of the strategy. Communicate effectively with the different stakeholders. This course targets purchasing staff with experience as buyers or in other functions, aiming to assume regional or global purchasing category management responsibility, particularly Key Commodity Managers and Senior Buyers in charge of commodity teams. Workshops will be used to provide participants with the opportunity to apply the tools presented. Participants will be asked to apply the methodology to their own commodities. Extensive discussions among participants will facilitate a dynamic and interactive learning environment. Sourcing strategy development from a corporate point of view. How to segment a portfolio. Understanding the dynamics of the supplier’s market. Purchasing strategy development by segment. How to find new potential suppliers. Total cost approaches to supplier selection. How to select strategic suppliers. Market Intelligence and the role of the KCM. Discussion on the difficulties of the KCM’s coordinating role and how to deal with it. Communication issues in relation to the management of commodity teams. Understand the processes and tools to implement SRM and Key Supplier Management. Identify the Key Suppliers in the company. Analyse the relationship with the Key Supplier. Understand the Key Suppliers strategy and its fit to the company. Set-up objectives to a Key Supplier. Identify the organisation and the process to manage key suppliers. Understand the benefits, risks and key success factors to implement SRM. Set-up a structured process to identify, to analyse and to manage Key Suppliers. Understand the function of a Key Supplier Manager. All purchasing staff involved in the management of a Key Supplier. Definition, benefits and risks of SRM. Identifying Key Suppliers in a portfolio. Focusing on a Key Supplier. Identifying the Key Supplier business strategy. Analysing the buying company’s attractiveness to the Key Supplier. Understanding personal networks among the company and the Key Supplier. Benchmarking several actual examples of Suppliers strategic mapping matrix and Global commodity strategic analysis. Defining objectives for a Key Supplier. Identifying the action plan to manage the Key Supplier. Setting up the organisation to manage the Key Supplier (Key Supplier Manager). Understanding the purchasing Company’s maturity levels to drive and enable SRM process: from transactional process to Value chain integration. Benchmarking several actual examples of performance measurement: Suppliers Scorecards, Customers Satisfaction Index, Suppliers Satisfaction Index. From Scorecards to qualitative TCO: integrating the customers’ expectations into Key suppliers management objectives through a global value measurement process. Lead functional analysis cessions for product and services by using standard methodology. Understand principles for Value analysis and its application to Dfx (design for X) optimisation workshops. Differentiate fundamental product cost elements linked to the financial income statement. Understand cost element drivers and impact on product cost. Create product or service should cost supporting suppliers cost breakdown analysis. Apply methodology to develop structured TCO model with key parameters and cost drivers. Develop a supplier engagement plan or cost reduction supported by in depth analysis of product cost elements. Technical buyers with technical background or culture involved in leading cost reduction activities. Other buyers willing to understand the cost drivers of their company as well as with their suppliers in order to identify and take advantage of saving opportunities. Each trainee will be given a handbook containing reusable templates used for the different tools. A master document will present each technique as seen during the training session. All tools and techniques are presented in a simplified and reusable way and illustrated by real application examples taken from various industries, including the most demanding ones (automotive, food, household...). Functional definition of requirement: a tool to better understand the real needs and avoid over specification. Concept of functions and functional specification. Understand when to use it. Step by step approach to build up a functional specification. Application to various situations: products, systems and services. Using the functional approach to support the purchasing strategy. From cost reduction to value management. Value analysis work-plan and conditions for successful implementation. Understand how to assess the value of the existing solution (importance of functions and benefit versus cost). Make a diagnosis of the design of a product using value analysis tools. Seek innovative solutions through brainstorming and other techniques. How purchasing can initiate and support value analysis projects. Understand cost structures and the key items in a cost breakdown. How to challenge suppliers’ cost breakdowns: machine cost, labour cost, material cost, overheads, and margin. What are the most frequent “mistakes” found in suppliers quotations? What is TCO in real life. TCO cost drivers and application to products or services. Integrate sustainability in the purchasing process. Solve problems using a structured approach. Create and implement a supplier development project. Engineers in Supplier Production, Logistics Sourcing and Sourcing Quality Assurance. All Buyers who need to develop suppliers’ performance. A whole set of tools and techniques will be presented and applied through workshop sessions. Understand how purchasing can contribute to create value. Make their company a preferred client to access valuable supplier innovation. Identify the unmet needs of the business. Find opportunities within the ecosystem. Involve suppliers in the innovation projects. Workshops and extensive discussions based on personal examples. Articulate the preparation with the conduct of the negotiation. Deploy a purchasing strategy in negotiation points. Build a tactics according to the positioning of the buying company in front of the vendor. Be aware of the unconscious reflexes. Diagnose intercultural mismatches before they block the negotiation. Get out of negotiation deadlocks, etc. Pre-requisite: Negotiation experience at an International level. Negotiation points: exchange values for the value exchange. Balance of Power, strong/weak strategy. Balance of criticality, offensive/defensive strategy. Combination of strategies into a negotiation tactics. Emotional leadership and relational intelligence in a negotiation. Getting out of deadlocks, analysis of a difficult case. The Certification Programme for Purchasing Managers focuses on management and leadership capabilities as well as the organisational aspects of purchasing. Among the management issues covered are strategy definition, organisation and team management. Leadership subjects include leadership styles, change management and communication. The Certification Programme for Purchasing Managers is targeted to purchasing executives with a solid purchasing background who are leading a team of buyers or to senior buyers aspiring to an executive position. Align the purchasing strategies to business strategies. Align the purchasing organization with business organization and constraints. Help their team to define appropriate category strategy. Manage the complex interaction between internal customers, purchasing teams and suppliers. Control the delivery of results according to the plan. The module is dedicated to purchasing executives with solid purchasing background who are leading a team of buyers or to senior buyers accessing to executive position. It is also suitable to experienced executives new to purchasing. Workshops and discussions will be organised in order to exchange experience between participants and the EIPM experts. Do we have the right Purchasing Strategy? We will start by clarifying what is a company business strategy. This is the basis to set-up a Purchasing strategy which is aligned with the company strategy. We will discuss what purchasing strategy is adapted to each of these options. Participants will work on their own company and purchasing strategy. Do we have the right Purchasing Organisation? Once the Purchasing Strategy is clear, the Purchasing Manager must set-up the right and adapted organisation. Which organisation is required to facilitate early purchasing involvement in product and service definition (Upstream organisation)? Which organisation is adapted to leveraging and coordinating the company needs (Downstream organisation)? Shall the company have a centralised or decentralised purchasing organisation in order to get the best out of the market? We will discuss the different factors and tools to support the decision process. We will review the various methods and tools and analyse their relevance in relation to the participants’ own environments. Do we have the right suppliers and management system? We shall discuss SRM-Supplier Relationship Management approaches in order to segment the supplier base and adopt a specific type of relationship to each category. Best practices to handle strategic suppliers will be extensively discussed. Do we have the right strategy implementation process? We will, with the help of the EFQM self-assessment methodology, benchmark the participants’ purchasing organisation. Create a 3 year roadmap to develop the performance of their purchasing units. Build a one page strategy that support effective communication to stakeholders. Develop and implement a human resource plan to attract, retain and develop people. Review and develop the performance of people reporting to them. Design and use performance measures. The module is dedicated to purchasing executives with a solid purchasing background who are leading a team of buyers or to senior buyers accessing to an executive position. It is also suitable for experienced executives new to purchasing. Participants will be encouraged to apply the methods to their own purchasing organisation. Do we have the right People skills? Do we have the right Performance indicators? Turn supply chain management into a competitive advantage. Create value for all actors across the chain. Strategically manage all types of flows. Achieve global efficiency by involving the supply chain from suppliers to customers. Purchasing managers who wish to leverage an integrated supply chain strategy. Supply chain practitioners who would like to enhance their knowledge of purchasing execution and challenges. Experts in fields such as Information Systems, Logistics & Warehousing, Finance, Production, Quality, that wish to develop a greater understanding of how Purchasing and Supply Chain should be integrated with their specific area and processes. Sales development people who wish to improve their understanding of the impact of Customer related inputs in the overall efficiency of the Supply Chain and Purchasing. Definitions: Is Supply Chain more than Purchasing? From Inputs, Conversion and Outputs to the virtual Supply Chain company. The life cycle’s dynamics: from TTM to TTT, TTV, TTC, TTR? Know themselves better, and how these characteristics impact their leadership. Appreciate differences and how they can draw value from them. Develop and coach their team members. Manage their stakeholder relationships better by understanding what is at stake for others, using different influence strategies, and having courageous conversations. Manage change and transitions better, through an increased understanding of reactions to change and how to handle them, and of the complexity of organizational change. As this module is about leading others, it is targeted to Purchasing managers who have the responsibility of leading a team or to Senior buyers transitioning to a managerial position. Presentation of models/methodologies followed by application exercises, role play or group work on real issues to allow for practice and opportunities to exchange experience with other participants, receiving individual feedback on strengths and development areas, personal reflexion. When leading others, it is important to begin by knowing oneself and one’s leadership style. The Myers-Briggs Type Indicator gives helpful insight into one’s personality and preferences, communication style, team behaviour and reaction to change. Participants will explore their own profile though exercises. Transition is a key moment in a career, which needs to be carefully navigated. Here, the focus is on leadership transitions, and what needs to be done when transitioning from one role to another. Emotional intelligence has an impact on leadership effectiveness. The different aspects of it are explored and applied to different leadership styles. Influencing is one of the most important skills in organisations today. A methodology is presented and participants work on their current influencing challenges. Coaching: One of a leader’s roles is to coach their employees and help them develop. Different skills required for coaching are explored and practiced through case studies. The participants also identify their own motivations and work on understanding those of others. Managerial courage requires the ability to say things that are not easy to say. Participants practice having difficult conversations using a methodology. The final day looks at change from an individual and from an organisational perspective. From an individual perspective, understanding reactions to change, the change curve, why people resist change, and how the MBTI type impacts our preferred way of dealing with change. From an organisational perspective, what are the key factors for successful implementation of change in an organisation.